Tim Tebow is dressed up as a Star Wars jedi and ready to take his fellow Heisman House players to a Halloween party, but everyone is running late. 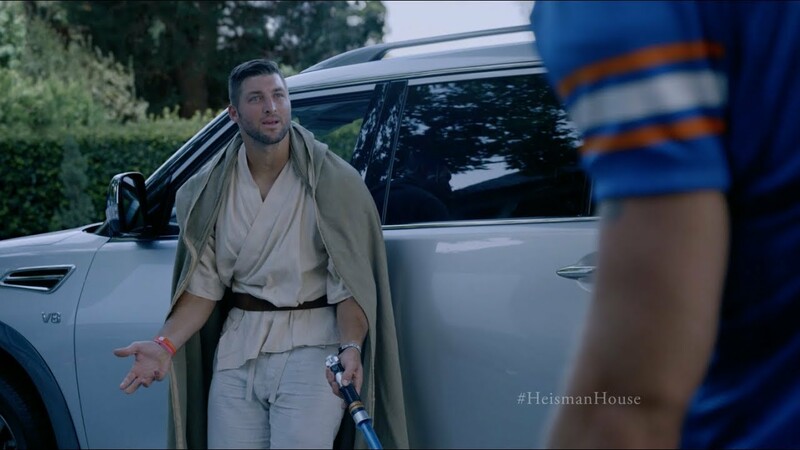 Luckily, their themed costumes are worth it: everyone's going as Tim Tebow from various points in his career starting when he played for the Gators in college. While the pals laugh hysterically at their well-executed Halloween prank, Tim is feeling a bit left out next to the jersey-wearing crew. It's not all about his career though; one guy is dressed as "Shirtless Tebow" and wearing a puffy muscle bodysuit with pecs that move when he flexes and another is simply "a baseball player," totally not a reference to Tebow's minor league career move. Hey, at least imitation is the highest form of flattery! Digital Agency: Critical Mass, Inc.